All links in this article are Target.com affiliate links in which we get a commission for purchases you make through the link. All images belong to Target.com. 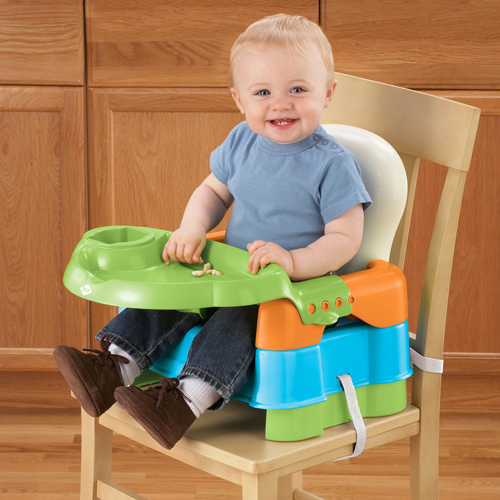 I have not done a review in a while, and I have to say that the Safety 1ˢᵗ Deluxe Sit, Snack & Go Convertible Booster that we have is fantastic!! Our daughter had outgrown high chairs, but she definitely was not ready for a chair yet, so we were looking for something somewhat adjustable so it could grow with her and this is great!! 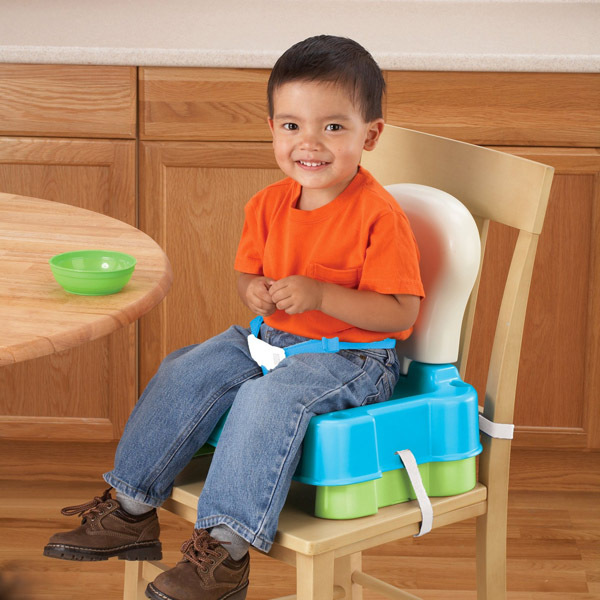 We have used this booster seat for around the last 7 months or so, and we love it! It came with a tray which is definitely what she needed when she first started using it. Since then she does not quite need it as much anymore, and we pull the seat up to the regular table, but still needs the straps so she does not get up and fall. She is quite the mover! All of the straps work and adjust very well both to my child and to the chair. 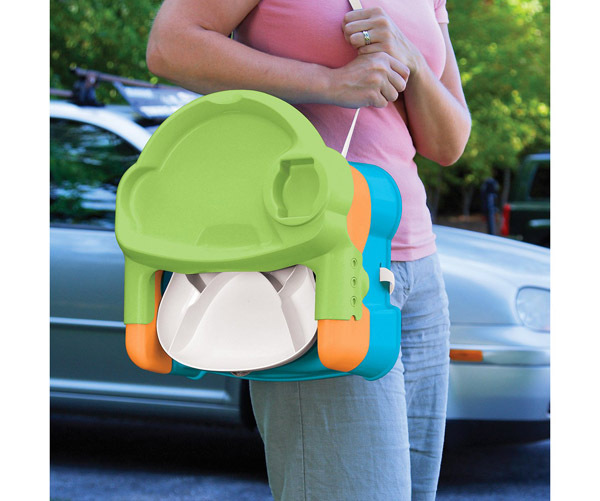 The straps are also very sturdy around the chair so that your child stays safe. It folds up very well, quickly and easily, so it is easy to travel with, with one of the straps turning into a shoulder strap for easy carrying. Not to mention it comes in a green, and pink, along with this green, white, orange, and blue one. One of the nice things is how long we will be able to use this booster seat. As I mentioned she started with the tray. You can also take the tray off to allow more room, you can take the arm rests off for more arm room, and there are little legs that kick out on the bottom to give your little cub a nice little boost up to the dinner table! The back even comes off for those older toddlers and kids that just need an easy little boost. The straps are attached to the base, so you will always be able to secure this to your chair and keep little cub safe! It has a very comfortable, easily cleaned, wipeable surface so food doesn’t get stuck on the seat. Just clean with soap and water and you are good to go! The one thing that may seem obvious, but I will warn, is if you keep the booster chair on your kitchen chair for quite a while, do not forget to take that booster off and give your chair a good clean, for after awhile it can get dirty. As cute as children are, they are not always the cleanest. Overall, this deserves 5 stars. You should not use it until your child is plenty good at sitting up, and maybe a little bit older. We started using it around the time my daughter turned 1. We needed something to easily travel with for the holidays, and found out that this booster is great for eating at home as well. Now before we know it she is getting pretty close to not needing a booster at all, I am SURE we will be there in the next year or so. This is a great and recommended product and if you are out on the market for something like this, this is what you are looking for. There are a lot of booster seats out there, but this one has plenty roomy with room for your growing child, unlike others that are just small with no room for growth, as I have seen a lot from the boosters grandparents buy. I suppose they do not see them grow quite as fast. That plus this being such a travel-friendly booster seat with a ton of great features I have mentioned previously, make this the perfect choice for your little cub! Any other good booster seats out there we should know about? Sound off in the comments below!